Here at USA Firearm Training we are committed to keeping all of our students, followers, and American gun owners up to date with the laws and regulations that effect us. To be honest, it is easier for us to stay up to speed with all the changes because of our network. We have about 15 instructors in 10 different states teaching in person classes and over twenty thousand past students that act as an informational network to help us stay up to speed. We also check DAILY for changes on the major industry publications, sites, apps, lobbyist groups, and other informational resources that help us source the rumors that are flying around. So, how do you get the updates? You fill out the form below. Yep, that simple. What will we be sending you via email? 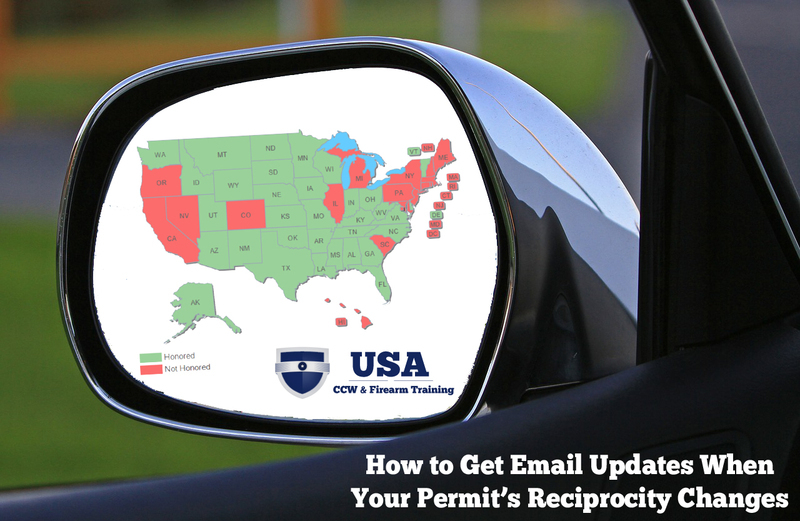 Just one email every time any state in the USA changes the permits they honor from other states. What if you hate getting our emails? You can unsubscribe at anytime. What if you want to get all the other emails that we send out? Go to this page and you can select this and any of our other email content you would like to receive. What if you need to know right now what states honor your permit (or combination of permits)? Use our dynamic map tool here.